Congratulations to Kelly Dycavinu for her second place win in the Fall 2012 Flash Fiction contest. She won for her story, "Duplicity." If you haven't had a chance to read this winning entry yet, then you can click here. Kelly is currently in her thirties, but feels twenty and wishes she was fourteen. Well, that’s mostly true. Except that she wouldn’t trade life with her husband and two children for anything. So the fourteen-thing doesn’t cut it after all. 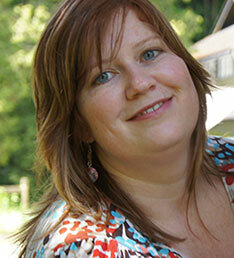 Based in Vancouver, Canada, Kelly has a BFA in creative writing from the University of British Columbia. She writes primarily for children and young adults; however, her stage play, Red Wolf, brings the world of fairytales to an adult audience. She also writes articles and personal essays that explore parenting, faith and social justice; and she writes academically in the area of literature, with a particular focus on intertextuality. WOW: Congratulations, Kelly, on your second place win for your story, "Duplicity." What inspired you to write this flash fiction story? Kelly: Thank you. There are a few strands of inspiration that wove their way into "Duplicity." The first is a moment when, for some reason, I was musing about the expression "two-faced" (used of someone who doesn't mean what they say or who says two different things depending on who's listening). I imagined the expression from a literal perspective and from there crafted a character who has the ability to see (physically) when a person is being two-faced. I thought this would be interesting. The second inspiration comes from reading a friend's short story. She unintentionally wrote the story in a way that could be read as either magical realism or as metaphor. The two ways of reading it co-existed perfectly, and I wanted to try writing a story like that. Can Shelley actually see the two-faces (magical realism), or has she psychologically snapped? I hoped to craft the story in a way that both could be equal options. A third inspiration comes from another friend who had only recently introduced me to flash fiction. In the end, I borrowed my two-face seeing character from a YA novel I'm writing and Shelley's story from a short fiction piece that had been left unfinished and made my first attempt at writing flash fiction. WOW: What an interesting concept to explore. Great idea! Why did you decide to enter it in to the WOW! flash fiction contest? What benefits do contests give writers? Kelly: I stumbled upon a link to the WOW! flash fiction contest. I may not have given it any consideration except that, days earlier, I came from a writing retreat where a friend had introduced me to flash fiction. To be honest, the minimal $10 entry fee is why I chose to submit the story. I personally hesitate with entry fees, as they add up fairly quickly (and don't all of us emerging writers dream of being in a place where our writing makes us money rather than costs us?). That said, without the motivation of the contest, "Duplicity" would still be an unfinished short story rather than a completed flash fiction piece. Contests are good for enforcing external deadlines. If you're like me, the self-inflicted deadlines don't hold as much authority. Also, in winning 2nd place, I gained confidence in my writing (a sense of validation, really), kudos from my friends, an award/publication to list on my CV, and some decent prize money. You can't win if you don't enter. WOW: I completely agree that contests are a great motivator in getting pieces finished and submitted! And look at all the benefits winning gave you! What themes did you want to explore in "Duplicity"? Kelly: Trust is a major theme. I wanted to explore the psychology of what happens to a person (in this case Shelley) when intimate trust is broken. Is Shelley's ability to see/hear the second face a reflection of how she has been scarred? She is no longer able to trust. Or is it a reflection of her enlightenment? No one is truly trustworthy. Deception is another theme. Darren is not the only deceiver. Shelley's actions are also, ironically, duplicitous. Yes. Entry into most writing programs is usually competitive. When I inform a publisher (or whomever) that I have a BFA in creative writing, I feel that it shows, on a very basic level, I'm skilled enough as a writer to have gained acceptance into a program and that I'm serious enough about my writing to have invested the time and money. No. Ultimately, degree or no degree, it's one's writing that speaks for itself. Yes. I learned a lot about building a career in writing... all the little details about query letters, the dos and don'ts of manuscript submissions; I met publishers, agents, authors, instructors, fellow writers and built some great networks. I feel the degree helped me establish a solid foundation in my writing career. No. All of the above can be learned or established outside a degree program. Even with my solid foundation, I feel I'm learning the most in the real world by writing, submitting to publishers, facing rejections, writing, meeting with my mentor, writing, winning a contest and more writing, writing, writing. WOW: Thanks for taking the time to answer that for us. I know many people really struggle with whether or not to pursue a degree. So, what are you currently working on? Kelly: A literary fiction novel based on the biblical character of Rahab, the prostitute. I'm telling her story prior to when we meet her in the biblical narrative. Actually, I just received word that an early chapter in the novel (as a short story) won prize money and publication. I'm thrilled with the news. The novel is a fairly large and research-intensive project; so at the same time, I'm also working on a number of children's picture books. Finishing a shorter story helps me to keep encouraged when there seems to be 'no end in sight' on the longer project. And I'm working on finding a home for some of my completed picture books. It's amazing how much work remains after a story has been written! Kelly: Reflections or personal essays on parenting, motherhood, writing, books, art, faith and social justice. WOW: Thanks, Kelly, for letting us pick your brain today! Congratulations again, and best of lucky to you with your short-term and long-term projects! Congratulations, Kelly! Isn't it great when our dreams finally see the light of day? So impressive.